by Robin Feldman. Harvard University Press, 2012. 288pp. Cloth $45.00. ISBN: 978-0-674-06468-3. Reviewed by Jordan Bergsten, Intellectual Property & Technology Litigation, Shook, Hardy & Bacon L.L.P., Email: JBergsten [at] shb.com. The views and opinions expressed in this article are those of the author and do not necessarily reflect those of the firm or its clients. Frustration with patent law is growing in the United States, as evidenced by Congress’s enactment of the Leahy-Smith America Invents Act in 2011 and President Obama’s recent executive actions and legislative recommendations “designed to protect innovators from frivolous litigation and ensure the highest-quality patents in our system” (White House). While volumes are written each year challenging specific doctrines in patent law, only the most ambitious authors dare to pinpoint an underlying problem that, if solved, would have widespread beneficial effects within the patent scheme. In Rethinking Patent Law, Professor Robin Feldman has set out to do just that. Feldman claims that many of the current problems in patent law could be solved if we began thinking of patents not as a one-time granting of a precise right, but as a license to bargain over the evolving scope of that right during the life of the patent. Feldman shines in marshalling theoretical support for her proposed conceptualization of patent rights and in providing easy-to-follow descriptions of complicated, pressing issues in patent law. But she largely neglects to discuss concrete benefits of accepting her thesis and fails to address likely counterarguments to abandoning the status quo for her thesis. The book also contains large descriptive passages with only a tenuous connection to the thesis. These failings weigh heavily on the reader, and the book ultimately fails to fulfill its ambitious promise. Chapter 1 lays out the theoretical argument for why we should view patents not as a defined right but as the beginning of a process of bargaining for that right. Here, Feldman makes her largest contribution toward advancing the thesis of the book. She draws both on the practical limitations of defining the boundaries of an innovative idea, as well as how those limitations are reflected in actual patent practice, to explain why it is more appropriate theoretically to view the patent right as one that necessarily evolves through bargaining after the patent is granted. This chapter convincingly establishes that it is worth debating whether we should view patents merely as a right to bargain. It does not, however, convincingly advance Feldman’s side of that debate. Significantly, this introductory chapter fails to adequately represent arguments for maintaining the status quo. For example, Feldman fails to address the most obvious counterargument to her thesis: that a patent application and the initial grant of a patent provide notice to the public of what is being made off-limits, and that the public is entitled to rely on that notice, even if our knowledge of the patented subject matter later evolves. Finding the precise line [*326] between fair notice and our evolving knowledge of the patented subject matter is one that courts often struggle with. One clear example where courts have done so is in patent reissue, where courts have labored to develop rules for whether a patentee can later expand the scope of his patent in light of the notice he provided to the public in his original patent application. Feldman has largely failed to enter or challenge that established debate, and instead relies on abstractions to build a positive case for her thesis. But by taking this approach she fails to convincingly demonstrate the practical value of adopting her thesis, however appropriate in theory. In fact, in some places the neglect of obvious counterarguments is so glaring that it borders on being misleading. For example, a subsection titled “The Limits of Language,” essentially argues that the current patent system is foolish to put so much stock in the language of a patent’s claims because existing words are generally inadequate to express truly novel ideas (pp.15-18). This subsection entirely ignores the well-established principle in patent law that a patentee can serve as her “own lexicographer,” providing new controlling definitions or even inventing new words in order to make clear to the public the scope of her claimed invention. Chapter 2 attempts to explain how patents actually operate. It points to several factors that can lead to a patent being broadly construed in patent licenses in the field, from application strategies to patent reexaminations before the Patent Trade Office (PTO). Because Chapter 2 purports to be more concrete than Chapter 1, I expected it to address many of the problems I discussed as to Chapter 1. I was disappointed in this regard. By the end of Chapter 2, the reader has reached page 74 of 212 substantive pages. 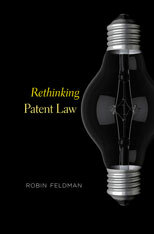 This far into the book, Feldman has suggested that we should change our view of patent law, but has not established one practical result of accepting her premise, has not addressed head-on any serious counterargument to accepting her approach, and has not made one positive recommendation for patent law supported by her approach. Indeed, she calls Chapter 2 “the descriptive chapter of the book.” (p.71). But Feldman sends the reader on into the purported normative portion of the book without any confidence that he has been given a balanced perspective on the patent law landscape and without a clear idea of precisely what Feldman is actually advocating. Chapter 3 appears to be an attempt to transition between the descriptive and normative sections of the book. Feldman argues that we should refine our patent system to best promote innovation given that patent rights will necessarily be defined by bargaining after the grant of a patent. But many of the subsequent discussions either do not clearly tie into the point, or tie into the point in conclusion only. For example, there is a four-page digression into what the word “utilitarian” means in the patent context in order to come to the well-established conclusion that our patent system strives to promote innovation for the benefit of the public. This uncontroversial conclusion sets the stage for several further uncontroversial points such as those found in the following couplet: “The threat of sovereign intervention may be a positive factor if it moves bargaining in a way that promotes [*327] innovation. Where evidence suggests that the threat is being used to deter innovation, a reexamination of the rules may be in order” (p.82). While agreeable, such conclusory statements, without more, do nothing to advance Feldman’s argument. She also provides a road map for the rest of the book (although unfortunately the chapters are both inaccurately numbered and out of order). The normative argument, Chapters 4-6, represents more than half the book, and contains easy-to-follow descriptions of three recent phenomena in patent law. But for the most part Feldman’s selection of discussion topics for these chapters is puzzling. The marketing materials for Rethinking Patent Law suggest that it shows how our current conceptualization of patents is an underlying problem in patent law resulting in unsatisfactory results across the field (see inside cover). And the first three chapters of the book generally make the case for accepting this concept. But these final chapters are almost completely devoid of any discussion connecting the author’s long, detailed descriptions of case law to her thesis. For example, Chapter 4 contains 46 pages describing patent cases on patentable subject matter, prefaced by a single paragraph tying in the book’s thesis, warning against granting too broad a patent right “[g]iven the extent of bargaining that is likely to occur” (p.98). While this paragraph makes the uncontroversial case for why the debate of patentable subject matter is important, Feldman does not begin to explain why the potential harm is exacerbated by the bargaining aspect of the patenting system. Following this minimal introduction is 25 pages describing the history of the debate on patentable subject matter with no mention of the book’s thesis. Feldman does a good job describing this history, but good summaries on this topic are easy to find. Intriguingly, on pages 124-125 Feldman proposes a rule for patentable subject matter: technology should be patentable if it “applies laws of nature, abstract ideas, formulas, insights into natural phenomena, and the like in a way that does not preempt current or future inventors from also utilizing those building blocks.” After a brief and unsuccessful attempt to tie this test into her thesis, Feldman spends the rest of the chapter applying her proposed test, not mentioning the book’s thesis again until the final page of the chapter, nine pages later. Although this is in itself an interesting proposal that is worth reading by anyone exploring policy solutions to the issue of patentable subject matter, the discussion largely distracts from the argument in this book. Chapter 5, discussing the interaction of patents with contracts and antitrust, and more specifically, “efforts by both parties in a negotiating setting to collaborate so that, together, they can receive more than the sovereign intended to grant to either one” (p.136), is an improvement over chapter 4. Although the book’s thesis is still not driving the discussion, Feldman fairly consistently assesses how each topic being discussed is impacted by the bargaining aspect of patents. Here, Feldman analyzes techniques allegedly used by companies “either alone or in conjunction with others, to extend the life of a patent” (p.158). Feldman warns the reader that “some of the materials described here [*328] represent only allegations of behavior by companies” but concludes that her descriptions are relevant “[e]ven if the allegations are not accurate” as a “roadmap” to the weaknesses in the overlapping legal regimes that bear on patent rights (p.164). That aside, this discussion uses a current debate in patent law to highlight practical benefits to adopting the author’s thesis. The chapter also stands on its own as one author’s view of patent practice during a turbulent period. For these reasons, this chapter will be a worthwhile read for those interested in how the current system might allow parties to work together to maximize, or even expand, their original patent rights. Chapter 6 provides examples of patent doctrines and practices that allow patentees to exclude innovation that was not known at the time the patent was granted. Feldman specifically looks at how these patent doctrines operate in the field of biological sciences. She concludes that “an invention should be defined in light of the art at the time” (p.208). Like the book, generally, this chapter is laudable in that it presents clear explanations of complicated subject matter, and frustrating in that it often strays quite far from the book’s thesis. In the introduction, Feldman only ties the chapter into her thesis by commenting that her examples undermine the idea that we can know the scope of a patent at the time when we grant a patent. But this point falls short of the book’s announced ambition. That is, from the beginning the chapter does not attempt to show how rejecting the author’s thesis leads to the complications discussed in the chapter. After that single comment tying the subject of this chapter into the thesis, the thesis is not mentioned again until the last three pages of this 31-page chapter. Thus, that one observation was the only thing justifying 28 pages painstakingly detailing patent cases. And even the three tie-ins in the conclusion of the chapter are vague and unhelpful. Finally, as a general point, it is difficult to identify the ideal audience for Rethinking Patent Law. The book does not expressly indicate an intended audience, although Feldman acknowledges at one point that the book may be read by “those in the trenches of patent law” (p.71). And the content of the book unfortunately does not settle the question either way. For example, the second page of the first chapter describes in detail the idea that a deed to property lays out the “metes and bounds” of that property. This point is standard fare for the first year of law school, apparently signaling that the book would be accessible outside the legal community. But while the author includes this discussion of property law in order to analogize it to the claims of a patent, an unfamiliar reader will not find an introduction to the concept of patent claims until page 42. By this point I expect anyone lacking a passing familiarity with the practice of patent law would be quite discouraged. Thus, the book’s varying level of detail will likely be frustrating at points regardless of the reader’s familiarity with patent law. In conclusion, the book’s weakly supported thesis, along with its general failure to justify the inclusion of the book’s frequent and overly long descriptions, is both frustrating and confusing. Feldman is clearly very knowledgeable about the complex topics [*329] explained in this book, and discussions like that in Chapter 5 may be valuable in isolation to the interested reader. However, the glaring problems in organization in this book and its failure to stay on point means any reader, regardless of his or her background, will have to work too hard in reading this book to make its cover-to-cover reading worthwhile. Copyright 2013 by the Author, Jordan Bergsten.